1) Expressive styling: With its chiseled new styling and athletic stance, the Camry has a more aggressive and eye-catching look than previous models. The exterior of the Camry is more expressive and athletic than ever before. The front bumper has been completely revised and features a wider grille shape that expresses a lower center of gravity. For all you choosy drivers out there, you will love that you have ten different colors to choose from, including Ruby Flare Pearl (red) and Celestial Silver Metalllic. 2) Modern and Refined Interior: Premium materials, a roomier feel and improved amenities gives the Camry a more sophisticated and refined appearance. The center stack smoothly integrates with the console and features a high-tech upscale look. The redesigned center console tray now offers a convenient power source in the storage box. In the interior, you will find detailed stitching and trim elements that are finished in satin chrome. 3) Quiet and Peaceful Cabin: In order to reduce unwanted wind and road noise, Toyota engineers worked on improving window and door seals to keep the noise outside. Even the carpet has 30% more insulation and the side mirrors were redesigned to better control air flow. The result is the quietest and most peaceful Camry cabin yet. 4) Advance Safety Features: The Camry was built with the safety of your family in mind, so it makes sense that the 2015 model is safer than ever. For 2015, the Camry will include safety-focused driver aids including Lane Departure Alert, Adaptive Cruise Control, Pre-Collision System with Auto High Beams and Blind Spot Monitor with Rear Cross Traffic Alert. 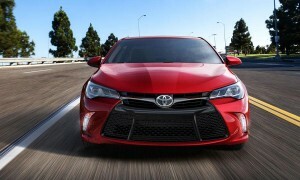 5) Enhanced Driving Experience: Once you get behind the wheel of the new Camry, you will feel the difference. Spot welds were added to the door opening flanges to enable spirited handling. Engineers added electric power steering on all Camry models that is tuned for better on-center feel, better straight line stability and more direct-feeling steering inputs. The new Camry has a hydraulic system that has been revised with a 2 stage brake booster that improves brake feel. Options for engines include a 2.5-liter four-cylinder or 3.5-liter V6 gas engines paired with 6-speed automatic transmissions, or a 2.5-liter Atkinson Cycle engine with Hybrid Synergy drive matched to an E-CVT. Are you in love? For the icing on the cake, be sure to visit us here at Marina del Rey Toyota in Los Angeles. We’ll be happy to answer any questions you have regarding the new 2015 Camry for sale. When it comes to our dealer this fall, be the first to get behind the wheel and give her a test drive. We’re confident you’ll fall head over heels!